Are you tired of making decisions alone? Do you feel you have no one to talk to at your level about your professional and personal concerns? The Vistage model brings together groups of business leaders in a safe, non-competing atmosphere where they can brainstorm opportunities and share their challenges to get brilliant solutions. The groups meet monthly, and each CEO group member receives one-on-one coaching from Nina. 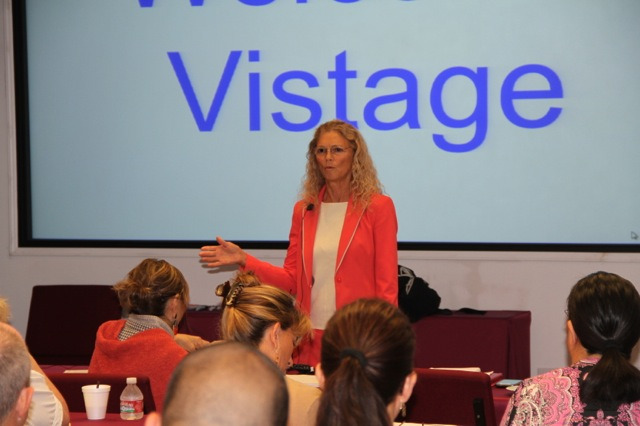 Expert speaker seminars are a valuable part of the professional development offered in Vistage peer groups. Nina develops a coaching relationship by meeting with each member privately to learn about his or her unique issues and to update strategic plans. She analyzes the business vision, systems, marketing, and policies—and makes recommendations. She holds each Vistage member accountable to his or her goals and objectives. Member companies grow at nearly three times the rate of competing American companies. The key to members’ growth is simply being part of an unbiased peer advisory group whose sole interest is the success of each member. In a room of 12-16 Vistage members, you will find 300-500 years of business expertise and wisdom! The Vistage members in Nina’s groups are not “lonely at the top.” They get feedback, support, advice, and sage opinions from their peers about their ideas and current issues. Members get a blanket of support with Nina’s monthly coaching and unlimited email check-ins. In my business I see the limitations. In my Vistage meetings I see the possibilities. Hawai’i members are connected online with 17,000 other Vistage members worldwide, and have access to an online library of 56 years of best business practices and resources. The mission-driven executives in Nina’s groups take time out each month to work ON their businesses. In addition to the goal of growing their companies and developing themselves as leaders, the members have a lot of fun together, share poignant stories, and develop lifelong friendships. Vistage has designed a year-long professional development program especially for the leadership team of individual companies. The aim of the program is to align the executive team while developing individuals. This program is designed for organizations with annual revenues of $50M or more. Mainland companies who have engaged in Vistage INSIDE are: Qualcomm, Equifax, and a host of lesser known businesses in industries as diverse as software, construction, information services, private schools, health care, oil & industry, retail, and manufacturing. What’s the crucial piece to getting the most out of your organization? Together with Vistage chair, Nina Cherry, you will configure the program components specifically to the needs of your company and tailor the content around your most pressing business needs. Content consists of one-to-one executive coaching, expert speaker seminars on topics of your choosing, and executive sessions to brainstorm opportunities and solve your most challenging issues.